Fishing from a kayak puts you directly on top of the action. Kayaks provide an easy way to get on the water and enjoy our natural environment. For anglers, the small size and nimble nature of kayaks makes them a great platform for fishing in fresh- or saltwater. Regardless of the type of kayak you own, a few well-placed accessories can make the difference between catching fish—or returning home skunked at the end of the day. 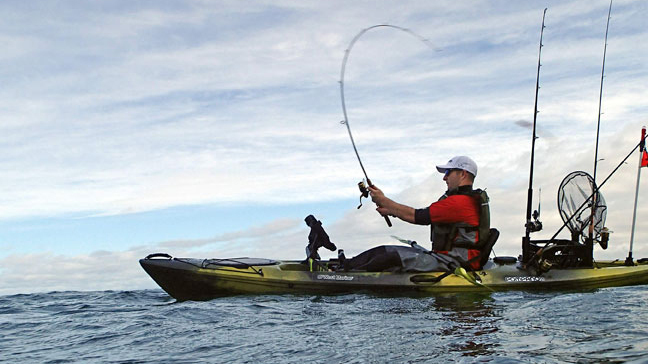 So here’s our advice on how to turn your kayak into a fishing machine! Get organized and clear your kayak for action! Organized anglers catch more fish. This maxim holds for any type of fishing—from a pier, boat, beach or from a kayak. Fishing rods, tools, flies, jigs, weights and other tackle must be kept out of the way, but within easy reach. Fishing kayaks frequently locate built-in rod holders behind the seat, which is great for keeping rods out of the way when paddling, but awkward if you need to grab a rod quick. If this describes your kayak, or if it doesn’t have any rod holders at all, install a couple of rod holders forward of the seat to make your rods easy to reach. Rail-mounted accessories like this rod holder are easy to install and remove at the beginning and end of your fishing day. When fishing, your paddle also needs to be kept out of the way, so if you have not already, install a pair of paddle clips. Also, if you fish in places where you might get snagged on an underwater object or on a bush or a tree, a paddle with a hook retrieval notch is best—which can save you the consternation and cost of losing an expensive lure or other tackle. The more time you spend with your lines in the water, the more fish you will catch—so it pays to fish with at least two rods. That way, you can keep one line “wet” while you switch out terminal tackle for the other rod. Depending on conditions, you may want to drift and cast. If you find that you are drifting too fast, consider reducing your rate of drift with a drogue. A drogue is an underwater parachute with a length of line that you attach to the bow of your boat. Most every kayak needs an anchor. Anchors serve two purposes. First, in the event that you lose your paddle or are otherwise incapacitated, anchoring is the best way to prevent your kayak from drifting into a dangerous area, such as a rocky shore with breaking surf or a constricted channel filled with moving boats. From an angling perspective, the other use for an anchor is to keep your kayak stationary against wind and current, and free your hands so you can fish while your kayak remains perched over your favorite hot spot. 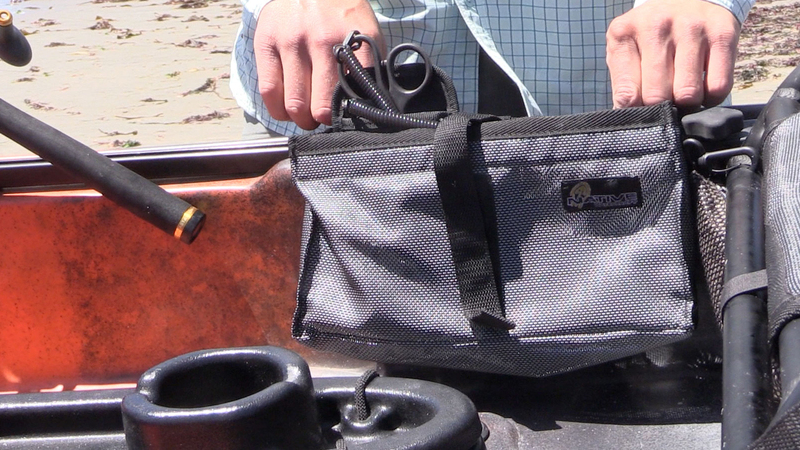 This rail-mounted gear bag puts tackle and tools within easy reach, but out of the way. Most kayakers use a 1 1/2- or 3-pound folding, grapnel anchor, which is easy to store. For calm lakes or rivers with little or no wind or current, the smaller anchor is generally ok, but for areas with surge, wind and current, the heavier 3-pound anchor is better. Grapnel anchors and anchor line can be purchased separately or as part of a Grapnel Anchor Kit for Kayaks. Along with an anchor, we suggest an anchor trolley system. These systems enable you to easily orient your kayak in relation to wind and current to optimize the direction of your casts. Many kayak anglers prefer to use artificial baits or lures, but sometimes fish will only hit on live bait. In this case, give’em what they want! A great option is the Cool Bubbles Live Bait Bucket, which includes a built-in, battery operated aerator that keeps bait alive for hours. This system fits easily into the storage wells on most kayaks. Another option to consider is a small cooler to keep refreshments and your catch fresh. Soft coolers are a good choice because they conform to the curved surfaces of storage wells in a kayak. You have plenty of choices among brands such as Yeti, AO and Igloo. Fish stories are great, but video proof is best! Preparing to record an epic day on the water. So what’s a fishing trip without a fish story? To record and share your epic days on the water and how you went “mano a mano” with those incredible lunkers you are going to catch, install an action camera in a waterproof case on an adjustable mount. Yes, you’re going to need a net! Unless you want your fish story to be about the one that got away, invest in a quality landing net, which should be kept ready in one of the rod holders on your boat. A small fishfinder can take the guesswork out of locating your prey. With available mounting systems, they are easy to install and remove at the beginning and end of your fishing day. Small fishfinders are generally sold with a transducer. 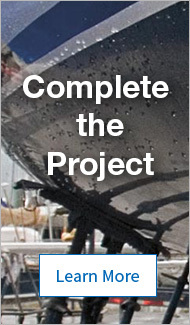 Depending on the style of transducer, you will need to mount it through a scupper hole, glue it to the inside of the kayak’s hull or suspended it in the water with a special mount that attaches to the gunnel of the boat. 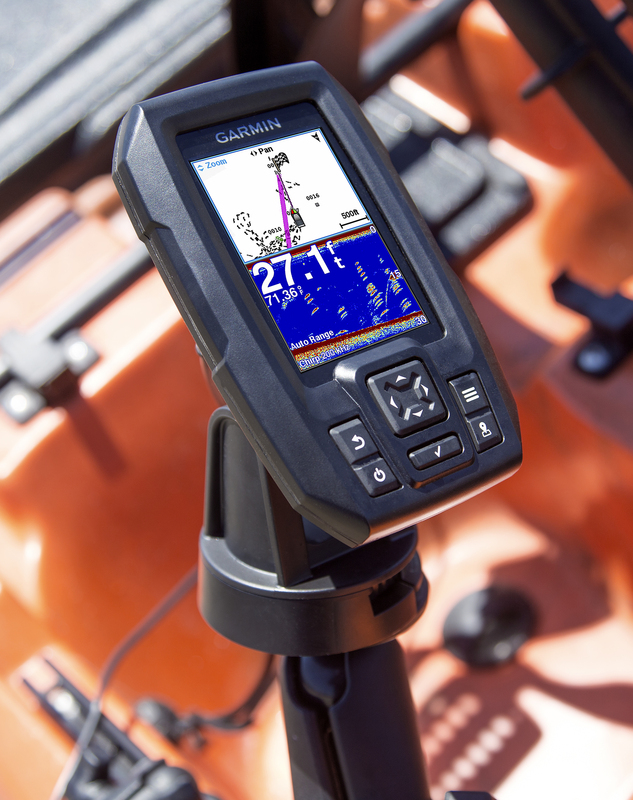 You will also need to power your fishfinder with a small battery, which you can locate under the deck of your boat. Protect the battery in a watertight box and secure the box against movement inside the kayak. To cleanly run your transducer and power cables and seal the holes where they pass through bulkheads, use small sealing glands. 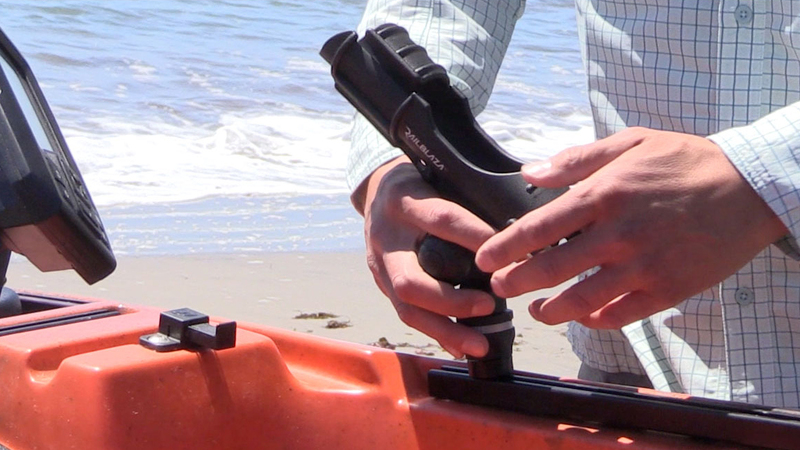 Installing accessories such as a fishfinder, action camera or rod holders on your kayak is easy with available mounts. Accessories can be mounted in fixed locations or slid on to grooved tracks. Fixed mounts and tracks both enable easy installation and removal of accessories at the beginning and end of your fishing day. For mounting a fishfinder, RAM Ball Mounts are especially popular, because they enable you to easily adjust the display for the optimum-viewing angle. In addition to RAM ball mounts and tracks, choices include tracks and mounts by RailBlaza and Scotty. 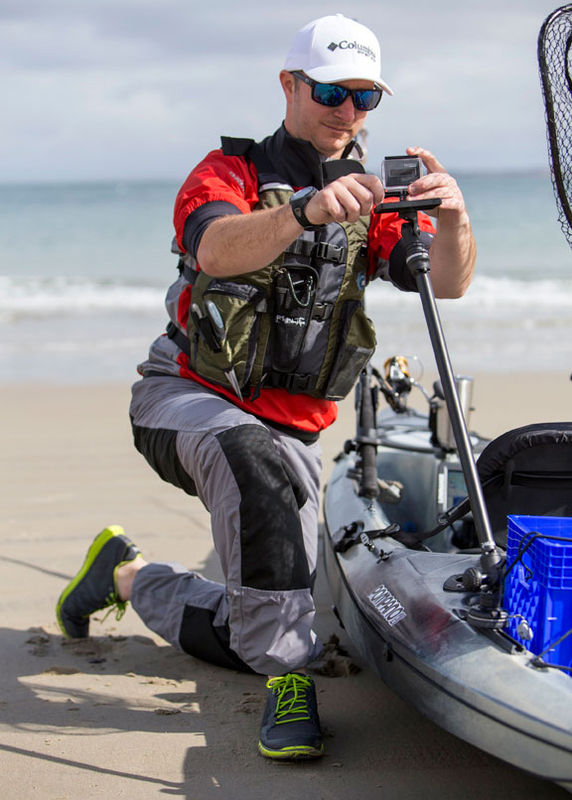 Fishfinders give kayak anglers an edge. Anytime you venture out on the water, make safety a priority. Safety begins with wearing a paddling life jacket. These are available in a wide range of colors and styles, many with fishing-specific features such as pockets for small tackle boxes and D-rings for small items like clippers for cutting fishing line. If you are out of shouting range of people on shore, be sure to take along a waterproof, handheld VHF radio, in case you need to call for help. Since kayaks can be hard to see, a smart idea is to announce your presence with a kayak flag, which you can mount at the stern of your boat. Other items you should have include sound signals, such as a horn or a whistle, and visual distress signals such as flares, and a small small medical kit. Stowing these items in a dry bag is a good way to protect and keep them ready for use. If you happen to be new to kayaking, check out our Beginner’s Guide to Kayaking. Get your fishing machine in gear! There’s virtually no limit to what you can catch from a kayak. From freshwater fish like trout, bass, pike and pan fish, to coastal species like redfish and sea trout—even ocean going monsters like wahoo and marlin, kayak anglers are nailing just about everything under the sun. So get set up with the gear you need—then paddle out and have some fun!